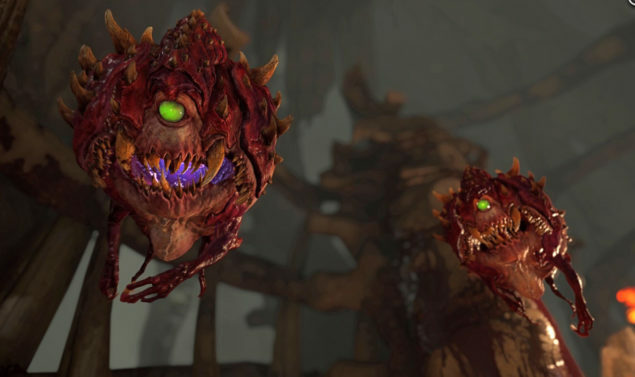 DOOM is definitely one of the most anticipated first person shooters of the year. The game has been in development for quite some time and the world is definitely ready to obliterate hordes of demons using some of the most powerful weapons available to man. Many of the game’s details have yet to be revealed, but it seems like players will be fighting some rather familiar faces in the upcoming new entry of the series. A few hours ago, players have had the chance to take a better look at the game thanks to the closed alpha, and have managed to discover some very interesting things about the game, such as the return of some of the series’ most popular demons, unlockables and much more. Here’s a summary of what has been discovered by Doom World forums user Almonds. -The project is internally named Zion. -The engine has a similar architecture to Doom 3’s. -There’s a new system named AAS2, which seems to be for collision and area data. -The CVar and Console Command systems seem to have been merged. -You can play as a Mancubus in MP (not available at the moment). -The Mancubus has a heat ventilation system in both SP and MP. It can kill you. -There is a new enemy named the Hell Soldier, but is only referenced in two places. Perhaps removed. -There is a Codex, I assume this is like Doom 3’s. -There are 6 keys. Maybe more. -The Cyberdemon can be resurrected, dash, strafe, charge attacks, use seeker missiles, evade your fire, use a gigantic scythe, do a ground pound, use missile barrages, and choose between several ammunition types. -He also has several stages of damage, where his behaviour changes. -Enemies have pain chances, and multiple states of pain. These are (ordered): twitch, heavy twitch, interrupt, stun, falter, push back, stagger, and knockdown. -You can modify your BFG. It has: Rapid Fire, Charge Attack, Beam Fire, Spherical Fire, Arc Fire, and Burn Fire. Burn Fire is a flame BFG. -It also has mods for double damage and increased capacity. -There is also a new weapon named the Arc Cannon. I do not know anything other than it does splash damage and charges cumulatively. -Another confirmed weapon is the Lightning Gun, and Damage Shield. -The Revenant can punch you. -Glory Kills can be disabled in PvP. -The PvP is UAC versus Marines. -There are unlockable player armor skins in MP. -SnapMap has a currency named snapCoins. These are not microtransaction bound, and are entirely just to keep you mapping. -There are a fucktonne of variables you can edit on everything ever in SnapMap. -There are modding tools named idStudio. These may not be available to the public immediately. -idStudio is very powerful, with its own scripting, action chaining, map tools, and much more. Some screenshots from the DOOM closed alpha have also been shared online. One of the screenshots of the closed alpha’s menus also revealed new details on the Nightmare difficulty setting, which promises to be a true nightmare. One week ago, a new DOOM trailer and new details have been shared by the publisher Bethesda. Wording in the press release regarding items that give players advantage in multiplayer matches made some fear that the game will include microtransactions, but thankfully it won’t be the case, according to Pete Hines. DOOM will be released on May 13th on PlayStation 4, Xbox One and PC.